Photo of the day: Gamjatang @ 동원집. From the ultra-modern neighbourhood of Gangnam, we move on to the more traditional and artistic Insadong today. I’ve been hoping to try Hanjeongsik and this is the perfect place to do that. The little alleys are filled with restaurants specializing in the traditional Korean meal. Our restaurant of choice was Chon. There were a few other restaurants which took place in a traditional house with seats on the floor but we read reviews that the food in some of those places may be a bit bland. 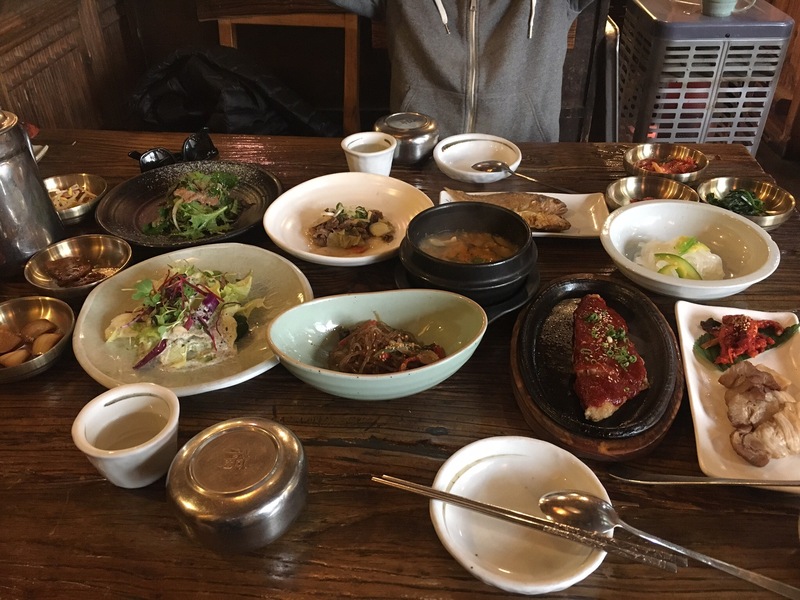 We ordered the Namchon set menu at 16,000 KRW per person ($18 CAD), as we were worried there would be too much food if we had ordered the larger sets. First came our 6 side dishes. They included the basic kimchi, sesame oil-infused greens, some marinaded seafood, sweet lotus roots, sesame oil bean sprouts and pickled onions. We took a bite of each and it confirmed our choice of the restaurant. All of the dishes were so tasty! I especially liked the sesame oil-infused greens one. Then all our main dishes came. We started with the hot dishes. First we had the sizzling fried fish doused with hot pepper paste, which was really good. Then we had their soup, which is a nice twist on the Japanese miso soup. Then I tried the Bulgogi expecting it to be hot but it was actually a salad version of the dish. The beef was still really good even though it wasn’t sizzling hot like we’re used to. Next, I had to try their other fried fish, which was nice and soft, much better than the one I had at the cafeteria the other day. Their mung bean noodle salad was very nice and simple, with thin slices of cucumber on top and seasoned with sesame oil. There were 2 other salad dishes, which I felt were both over-dressed. Their Japchae was also very flavourful, but too oily. Finally, my favourite dish was the pork belly. When combined with the green onion drenched in hot pepper paste, it was the perfect combination of all the right tastes and textures. I was surprised that the amount of food was not overwhelming. I did not feel stuffed after the meal. Overall, very delicious meal with appropriate portions. I’m very happy with my first experience with Hanjeongsik. After lunch, we began exploring the quaint street and alleys of Insadong. We immediately got distracted by an attractive tea store, Osulloc, selling green tea roll cakes. We walked in, tried some of their light green tea, took at look around at their merchandise, then ordered ourselves a sejak green tea and a green tea roll cake. They had seating on the 2 upper floors. The first floor was more like a cafeteria and was full of people. The second floor did not have windows but provided a nice, dimmed and quiet ambience to enjoy your tea. We chose to sit there. Our tea and cake came in a tray along with a timer and a mochi treat. Our server was very attentive and immediately brought over an extra cup once she saw there were two of us. After the timer went off, we poured the tea through a strainer into a bowl, then transferred that into our cups. The colour of the tea was very light, with a corresponding light taste. It reminded me of the Chinese dragon well tea. After we were done, we got the server’s attention and she immediately knew we wanted some more hot water. The second run was darker and had a richer taste than the first. As for our cake, the green cream in the middle of the roll tasted like butter. The cake itself did not really have a strong taste of tea, which was disappointing. 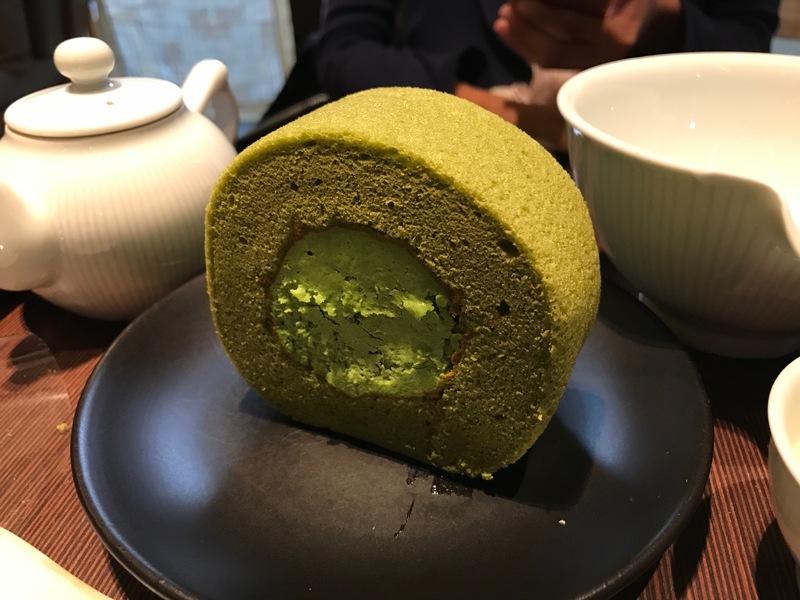 The green tea roll cake that lured us into the store @ Osulloc Tea House. Photo credit: Aaron. 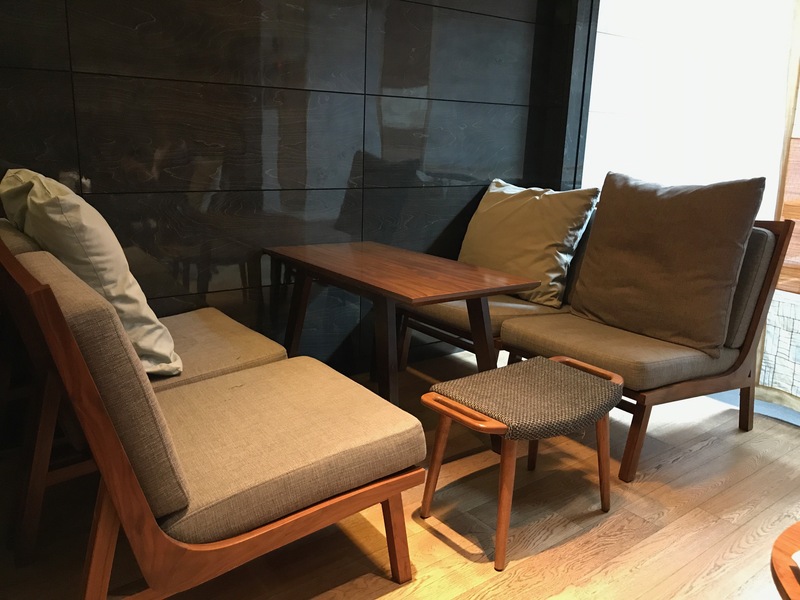 Nice seating on the top floor of Osulloc, Insadong. Photo credit: Aaron. We continue on to explore the area. We came across Ssamziegil, a multilevel plaza, filled with small stores selling all sorts of artsy souvenirs. There was also a poop/toilet-themed cafe on the top floor. Another way to declare your love by writing cute little love notes and hanging them up here @ Ssamziegil. On the streets, we noticed a lot of people wearing traditional Korean costumes. Apparently there were quite a few stores in the area where you can rent these out and walk around with them. Their customers were mostly young ladies but I’ve also seen couples walking around as well. It was really nice seeing the different architecture and shops here compared to the previous neighbourhoods we’ve visited in Seoul but it was getting really cold, so we sought refuge at Caffe Themselves and got some work done, alongside many others who were also buried in their books and laptops. We were going to get some dinner nearby, but we’re disappointed to see that most of the restaurants in the area has closed by now. The streets are dead, except for a few street stalls. We had a chicken skewer to pull us over and were intrigued by how meticulous the lady was cutting the tiny burnt bits off while carefully grilling the skewer. 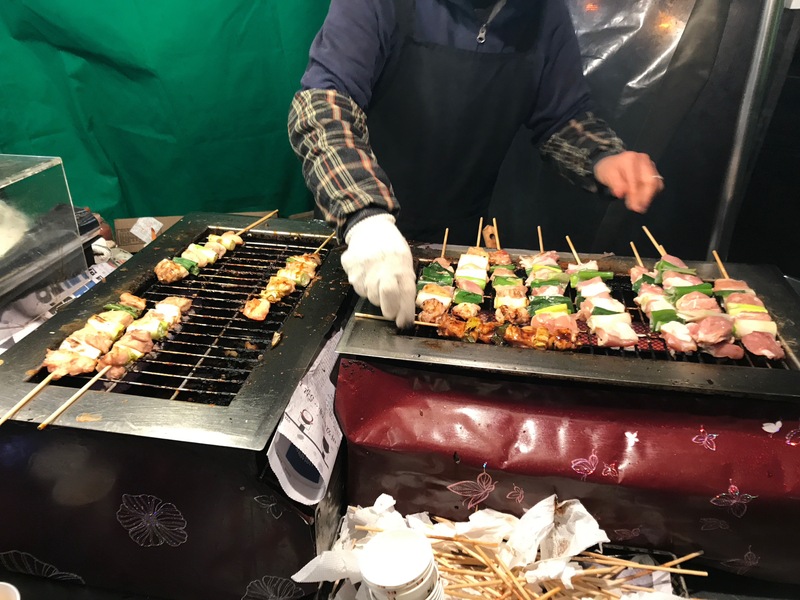 It was, as delicious as the first Dakkochi we had at Namdaemun Market. Dakkochi stall in Insadong. Photo credit: Aaron. We realized we were actually close (i.e. 2 subway stations away) to a place specializing in Gamjatang that I have been meaning to visit, so we made our way over to the industrial area of Euljiro-3-ga. It was interesting to see how this area was more lively than Insadong at night. The many establishments here, which appeared to be beer gardens, were full of people. Playing another game of matching Korean characters, we found the place we were looking for – 동원집. What initially looked like a cozy place with a few tables turned out to be a multi-room restaurant pretty filled with locals. 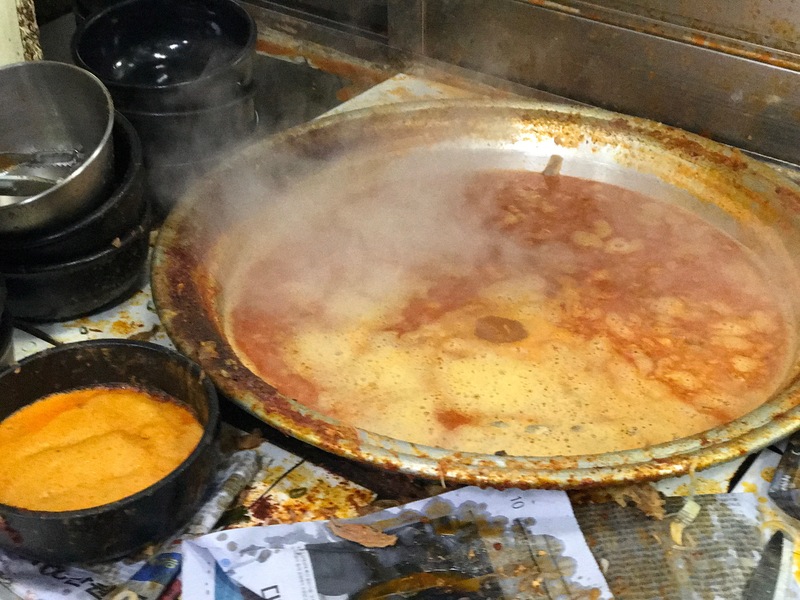 It kind of reminded me of some of the famous restaurants we’ve been to, like the Bun Cha Huong Lien in Hanoi and Kau Kee Restaurant in Hong Kong, where the front dining area is just the tip of the iceberg. Luckily, there was a table available for us upstairs. It appears the staff here do not speak English, so I pumped myself up to order in Korean, after reviewing a few phrases online. To my surprise, the lady does not appear to be speaking Korean to me. I was very confused at first but realized she was speaking Chinese! She was very honest in informing me that a medium pot that I pointed to on my phone would’ve been too much for the 2 of us and she recommended ordering 2 personal-sized ones instead. They seemed really busy and our food took a while to come, but it was well worth it. We already saw the huge pot of broth brewing downstairs and were excited to see it now sitting in front of us. It was interesting that the Chinese name for this is called “potato stew” but it was really missing the most important part of the stew, which was the pork bone. They were generous with their portion-sizes and we had quite a few large bones in each of our small bowls. The meat was tender and just fell off the bone. The broth was tastier than any other Gamjatang broth I’ve had in Canada. There were only a few pieces of potato, which is probably a good thing because we already have rice as our carb. I enjoyed the rice by dipping spoonfuls of it it into the broth. It was amazing and all only for 7000 KRW ($8 CAD). It was much better value and much tastier than the oxtail soup we had the other day in Namdaemun market. Overall, I was very impressed with this authentic version of one of my favourite Korean dishes. Eating Gamjatang in Canada will never be the same again. Enormous pot of boiling Gamjatang broth @ 동원집. Photo credit: Aaron.